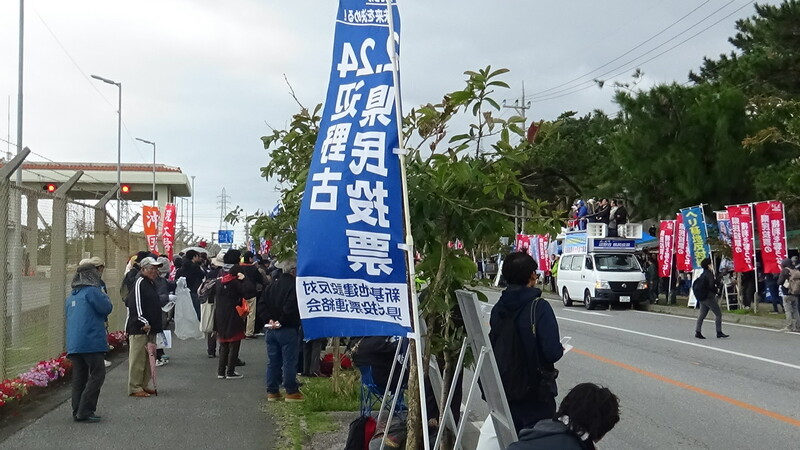 Home » Daily Report » action » Apr 4 (Thu): 7 banners and a tent were stolen in Awa and Takae, respectively. / Rocks were dumped with a roar into the sea at the K8 seawall. 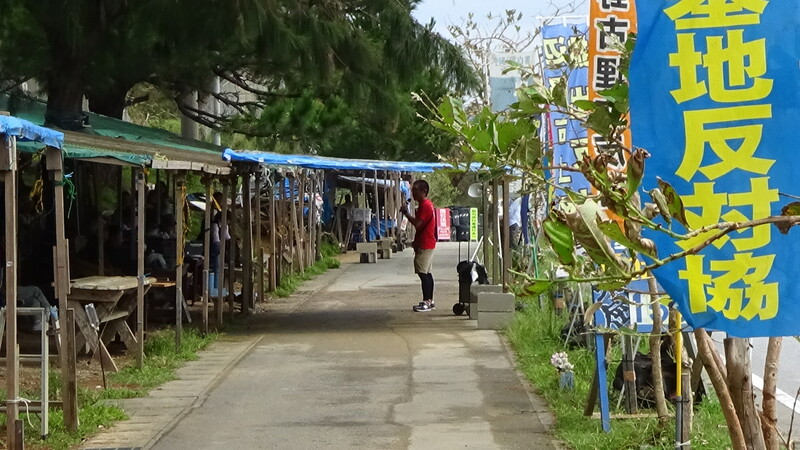 Apr 4 (Thu): 7 banners and a tent were stolen in Awa and Takae, respectively. / Rocks were dumped with a roar into the sea at the K8 seawall. About 40 protestors started a sit-in at 8:30 in the morning. They were removed in several minutes and detained in a makeshift detention place by the riot police. Mixer/dump trucks continuously entered into the gate. Construction of the seawall seemed to be performed at a fast pace. The officers of the Okinawa Defense Bureau cried from the military base, with a microphone in hand, “The vehicles are passing. It is dangerous to stand in front of the gate. Please step away from the gate.” As shown in the picture below, female employees were pulled into the site. 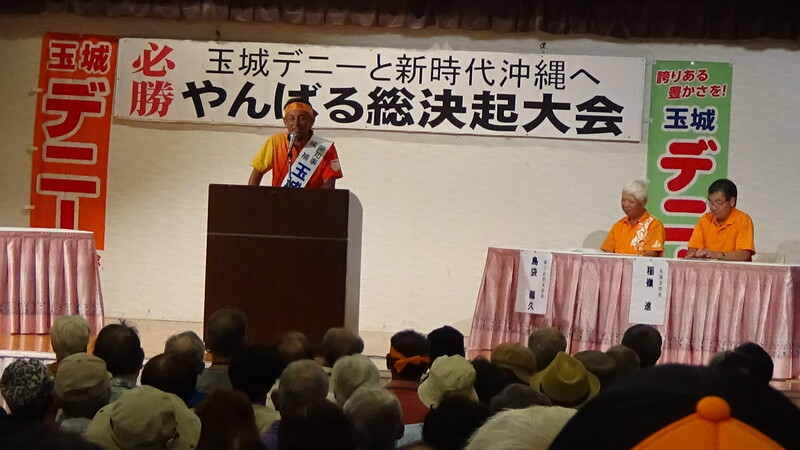 They might be also “Uchinanchu (Okinawans)”. They must have heard from their grandparents or parents something about the cruel war or military bases in Okinawa. They saw, without moving, the protesters who were removed. Their apologetic eyes were impressive. A small number of the citizens protested against the construction all day. 490 dump trucks delivered soil/sand. Two carriers left the pier. 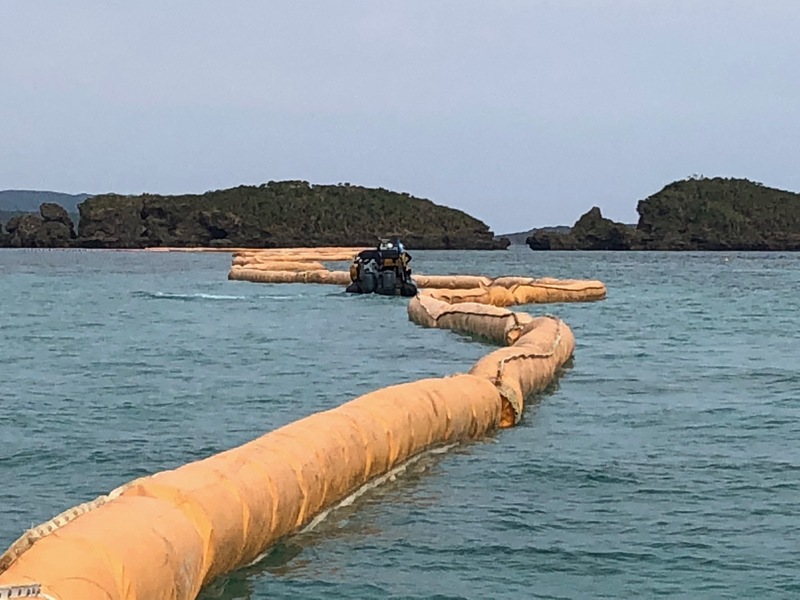 7 banners and 37 flags possessed by the citizens protesting against the construction of a new military base, which were shown in front of the pier in Awa and Motobu-cho, were removed by someone ten days ago. These are placed at a public area, but removal of personal belongings is obviously an act of stealing. The theft was reported to the police at once. The security guards of a private corporation are supposed to stand at the entrance of the pier all night long. The theft was committed in front of a security guard so a culprit should be immediately identified, but the police is reluctant to take action. The picture below shows a banner placed at the entrance of the pier.